Excavation work at Japan's largest mounded tomb has revealed that one of its surrounding greenbelts - and not just the tomb itself - was paved by many stones, signalling the massive manpower required to build it, experts said Thursday. The findings shed light as to the structure of the grave of Emperor Nintoku in Osaka Prefecture, which largely remains a mystery because the Imperial Household Agency has restricted access to the site in an effort to ensure "peace and sanctity." The tomb, also called Daisen Kofun and built in the fifth century, consists of a keyhole-shaped mound, alternately surrounded by three moats and two greenbelts, or dikes. 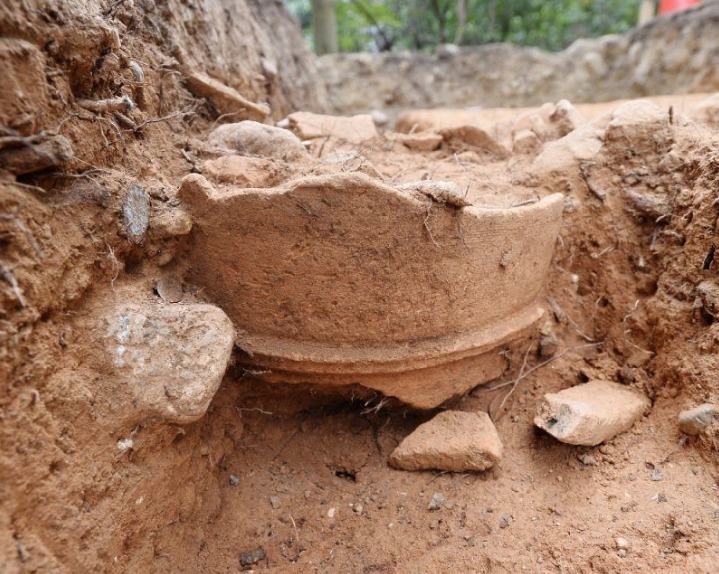 From October, the agency has worked with the local government to study three locations in the inner dike as part of efforts to find ways to preserve the tomb. The Daisen Kofun is known as one of the three largest mounded tombs in the world, together with the Mausoleum of the First Qin Emperor in China and the Great Pyramid of Giza in Egypt. 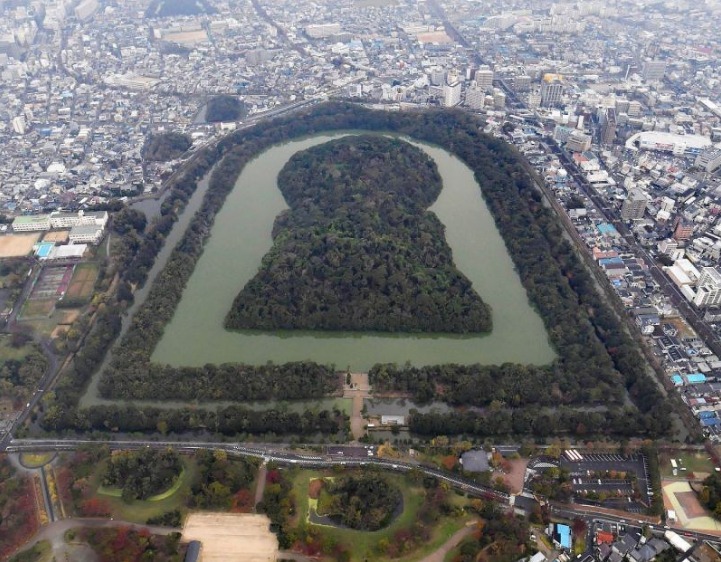 Japan is seeking to register the Daisen Kofun and nearby tombs as a UNESCO World Cultural Heritage site next year. Mounded tombs are usually covered with stones to avoid collapsing. 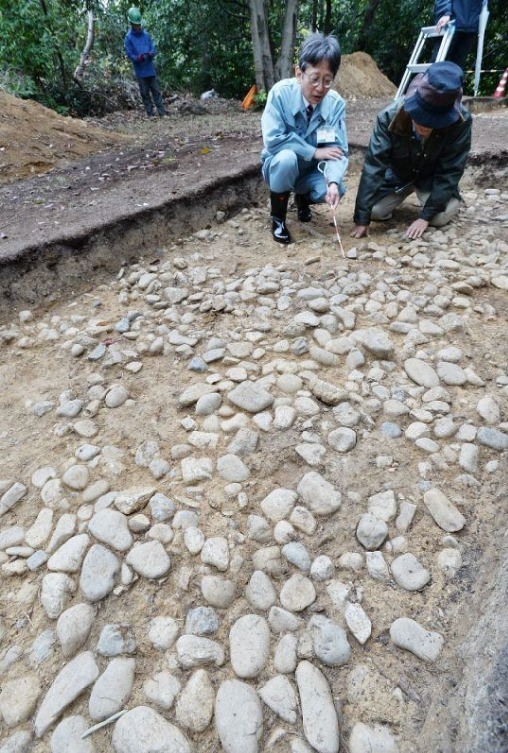 But the latest survey found that all three locations at the Daisen Kofun also had the stone layer, indicating that the tomb's inner dike, which has a total area of 65,000 square metres, was fully paved. 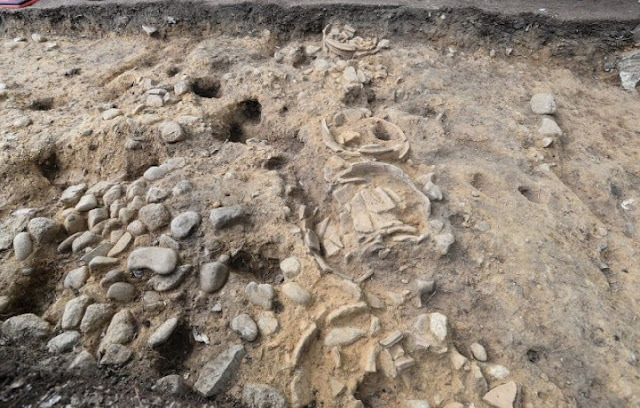 "This is overwhelmingly unique," said Kazuo Ichinose, an archaeology professor at Kyoto Tachibana University, as he visited the excavation site that was shown to researchers and the press for the first time Thursday. Ichinose said he estimated the mounded tomb to have been covered by about 50 million stones. "But if a stone pavement also existed in the dikes, the time and effort devoted to collect the stones and carry them must have been immense," he said. Katsuhisa Takahashi, a professor at Hanazono University, said the stone pavement functioned to "keep the area clean." "Surrounded by clay objects and white stones, we can imagine the inner dike having a sacred image like a shrine," he said. Some other researchers who visited the tomb in Sakai, Osaka Prefecture, called for carrying on and expanding the investigation, as well as opening the site to the public.